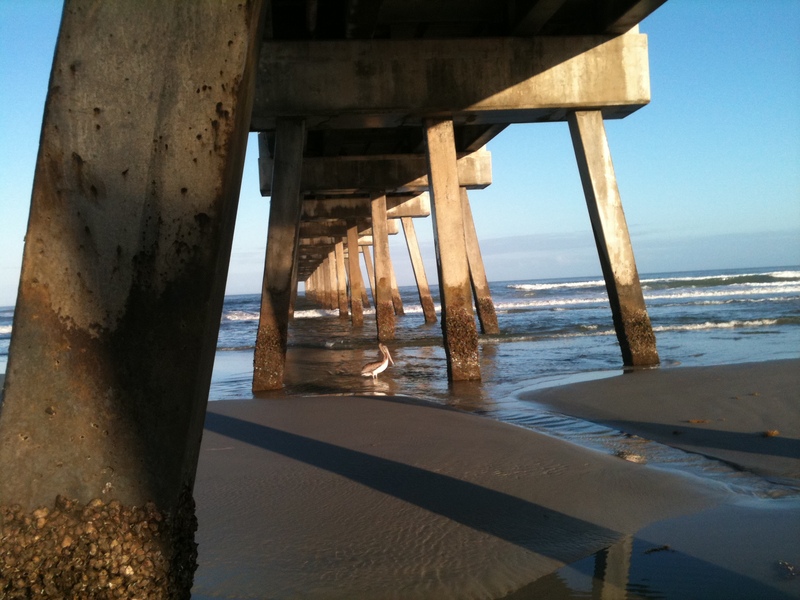 “Him” was a pelican meandering between the pillars of the Jacksonville Pier at the water’s edge. Intermittently he would swim a few feet when the ocean lapped up around him and then return to walking as the water line receded. Several pictures of the pelican were already on my iPhone before the man on the bike warned me to stop. He wasn’t the first stranger to approach me on the beach. Walking a few miles up and down the coast several times each week puts me in the path of interesting, and sometimes weird, individuals. Although few are creepy like shark tooth man, I tend to keep my distance and maintain my pace as I pass people. I have my walk to get in and they have their lives that don’t need to include me. The pelican protector wasn’t creepy but seemed intent on talking to me, so I paused my walk long enough to learn that the pelican had oil on his wings and his protector’s name was Ray. Ray also told me that since the pelican couldn’t fly and therefore couldn’t eat enough on his own, the fishermen on the pier above had been throwing down bait to the bird. Half an hour later as I made my way back down the coast I found Ray still straddling his bike and keeping watching over the pelican, warning walkers and surfers alike to give the bird space. With his right arm was in a cast, resting on the handlebars, Ray took up our conversation where we’d left off earlier, schooling me on normal pelican behavior and the work of the bird sanctuary to the north that would be picking up the pelican and returning it to health. As a former surfer and longtime local, Ray knew a more than a little about all things Jax and was eager to share that knowledge. When I told him I was new to the area he launched into a list of parks and beaches I should visit, complete with driving instructions and landmarks to look for along the way. Ray also told me which local bars were the ones to frequent and where I could play a game of pool for a quarter. I am extra appreciative for that last tip and plan to check it out soon. I had to leave before the pelican was rescued but trust that Ray made sure everything worked out for the best. I didn’t realize that Ray and the pelican were part a theme week until my next walk, when I was once again stopped by a man on a bike. This time I was walking with my husband. We were on the return lap, approaching the ocean rescue station, when I saw a man on a bike enter the beach and stop to take in the view. He was wearing a helmet and straddling a significantly upscale bicycle with a small, single-wheel trailer packed full of what looked like spare clothing, bedding and supplies. “Excuse me,” man on a bike #2 said as soon as I was within hearing range. “Whatcha need?” I thought maybe he was lost and wanted directions. Man on a bike #2 knew exactly where he was and what he wanted was to have his picture taken with his front wheel in the ocean. My husband stepped up to oblige, patiently following the man’s instructions regarding the angle and counting to three so that he could pose and flash a peace sign alongside his wide smile. We quickly learned that man on a bike #2 had just then completed a coast to coast bicycle trek. In 75 days he had traveled from Los Angeles to Jax! We were the first to congratulate him and he was still smiling as we wished him well and left him there to enjoy his moment. We forgot to ask his name, however, so he remains man on a bike #2 for all eternity unless, by chance and internet, he is identified. In two days I had talked to two men who at first appeared to be striking opposites–the local ocean wildlife guru and the L.A. visitor whose only interest in our beach was getting his tire in the water to symbolize the finish line for a personal journey. What they had in common, besides their mode of transportation, was a unique perspective of our surroundings and a drive to share that perspective with anyone and everyone crossing their path. Isn’t that a good description of a writer? From those encounters I take away a gentle reminder to be tiny bit more open to strangers I pass in the sand, on the off chance that they have something unique to tell me. I am also now affectionately referring to the past seven days as Men On Bikes Talk To Me week.